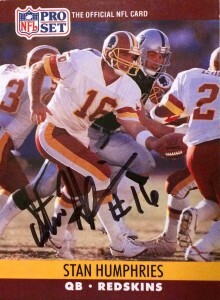 After a solid 4 years playing quarterback at Northeast Louisiana, Stan Humpheries was selected in the 6th round of the 1988 draft by the Washington Redskins. Joe Gibbs loved to groom quarterbacks so Humpheries faced serious competition from the likes of Doug Williams, Mark Rypien, and David Archer. Humpheries made the squad but thanks to the quarterback loggerjam, did not see any action until the 1989 season in mop up duty. In 1990, with Doug Williams retired, Humpheries assumed the backup job behind Rypien. Stan guided the ‘Skins to a respectable 3-2 record in his absence. Washington won the Super Bowl title in 1991 as Mark started all 16 games. 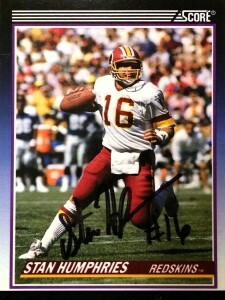 Comfortable with the situation at QB, the Redskins traded Stan to the San Diego Chargers in 1992. The San Diego Chargers had been in quarterback purgatory since the retirement of Dan Fouts in 1987, going through 11 starting quarterbacks. John Friesz had become entrenched as the Chargers’ starting QB after starting all 16 games in 1991, but after a season ending knee injury in the 1992 preseason, the Chargers were in emergency mode. San Diego dealt a 4th round (conditional 3rd rounder) for Humpheries. 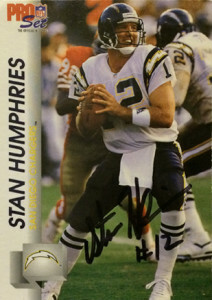 Stan went on to become the Chargers most prolific passer in team history, winning 47 games, leading the team to its only Super Bowl appearance (XXIX) in 1995. He threw for 16085 yards and 85 TDs, in 16 seasons for San Diego. Since retirement he has been selected as a member of the Chargers 50th Anniversary Team, and the Chargers Hall of Fame. Stan has done some color commentary and has returned to coaching. In 2016 he was coaching at the University of LA- Monroe.